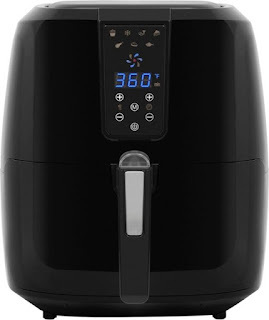 Huge savings on the Nutri 5.5L air fryer today only! Today Only at Best Buy! Get the Chef di Cucina Nutri AirFry 5.5L Digital Air Fryer for $100 off! This page uses affiliate links that at no extra cost to you, gives a small commission when you shop and purchase using them. That's right, I said $100 off! Today only you can save big and get this 5.5L Air Fryer for under $70! Originally $169.99 today you can get it for $69.99 at Best Buy on their Deal of the Day offers. This 1800W air fryer is sure to make cooking everything from roasted potatoes to wings a breeze. Digital timer allows you to easily monitor the cooking and ensure your meal will be great. We use our air fryer continuously for roasted sweet potatoes and regular potatoes. The taste is better than a regular oven and cooking time is faster. I highly recommend an air fryer for convenience and a healthier alternative to cooking with oils. Get free shipping with your order or choose free in store pickup where available. Looking for more deals. Check out our Facebook Group where we post items daily to help you save All Year! This page uses affiliate links that at no extra cost to you, gives the writer a small commission when you shop and purchase using our links.